Paul Ayres: Bio & Choral Music | Santa Barbara Music Publishing, Inc.
Paul Ayres (b. 1970) was born in London, studied music at Oxford University, and now works freelance as a composer & arranger, choral conductor & musical director, and organist & accompanist. His music usually involves words - solo songs, choral pieces, music for theatre productions - and he is particularly interested in working with pre-existing music, from arrangements of folksongs, hymns, jazz standards and nursery rhymes to 're-compositions' of classical works, as in "Purcell's Funeral Sentence" and "4A Wreck". New pieces for 2005 include "The Spring" for the BBC Singers, "Three" for Gallions School string orchestra, "Cole and Co" (children's opera) for the Essex County Music Service, "This Sceptr'd Isle" for the Exmoor Singers and "Sink or Swim" (incidental music) for Quicksilver Theatre Company. 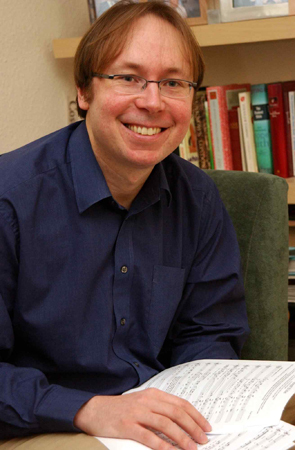 Paul is assistant director of music at St George's Church Hanover Square, plays piano for improvised comedy shows and has given many solo organ recitals in the UK, Scandinavia, Europe, North America and Australia. Visit www.paulayres.co.uk to find out more. Paul Ayres has 1 titles published with Santa Barbara. Click on any title below to view the complete score and hear a recording if available. | Santa Barbara Music Publishing, Inc.
All scores, recordings and materials on SBMP.COM are protected by copyright - All Rights Reserved.